Previous Post: Man, You’re Soaping Me Blue! Your soaps are all so beautiful! I love your tutorials. I am fairly new to soaping and I have a question about preservatives, I have not used the lab colors and I am wondering why they need one. Also I love your carrot buttermilk soap and I don’t understand why that does not need a preservative. Please explain. The reason you need to use a preservative in your LabColor is that you will be diluting it with water, and anytime you are using water (other than cold process soaping), you are going to want to use a preservative to keep any bacteria or mold from growing. And, in both melt and pour and cold process (like the Carrot Buttermilk Soap), you don’t need to add a preservative because they both have a pH level that does not allow mold or bacteria growth in the soap. Plz lemme know how to make my soap in gelled phase to avoid the bad dark color? Thanx for ur nice soap really looks great, i wana ask u some questions , im a beginer in soap making and i faced some problems themfirst is in the cold process after i get my bars out then leave them as they say 2weeks for saponification , the nice creamy color would be changed after my soap gets dry !! Its bad and i dunno how to stop this its naturally happens , second Q i tried milkmsoap but it turned to light brown color although i used slushy frozen milk , any advise to get a nice super white bars? 2. Most milk soaps will naturally turn brown because that is the nature of using any type of milk in cold process soap. But you can always add a bit of colorant to help lighten it. It won’t turn it super white, but it will give you a bit of a lighter color. I’d suggest trying out: Kaolin Clay, Titanium Dioxide or a white mica. Or you can call customer service toll-free at 1.877.627.7883 and they would be able to help you place an order! But, at this time our products are not available on Amazon. Cracking where? At the top, right down the middle perhaps? The soap looks wonderful, so I will try it. But I don’t have the exact colorants and fragrance so I will use the ones on hand. I have two questions: What is the reason why you’re working with 140 degrees? I don’t have your labcolors so I will try a different colorant and wondered if the temperature is related to the colors and/or the fragrance you used? I also plan to use an EO blend of rose, lavender, geranium and some scent coming from chamomiles infused in olive oil. Would you rather suggest lower temps? Thx so much… One more question: It is often said that palm kernel oil and coconut oil almost have the same qualities, and I see in different soap recipes – as well as this one- that both are included. I really would appreciate if you could explain their difference and effect on the soap. Thx again 🙂 P.
Palm Kernel Oil and Coconut Oil definitely contribute different things to a soap recipe. The Palm Kernel Oil is much harder than the Coconut Oil, and we usually add it to our recipes to help make the soap last a little longer. 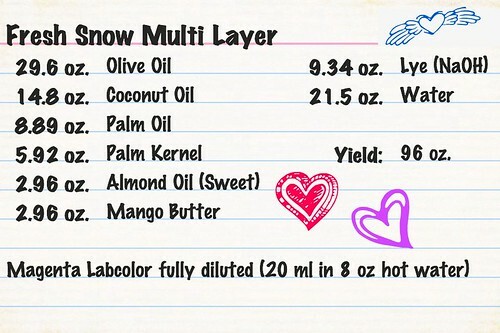 But, it does lather less than Coconut Oil, which is why we’ve included both in this recipe. I just LOVE all your tutorials and i can NOT wait to try this!!! I have just registered my soap business, Marvalous Creations and am definately looking forward to trying out all your beautiful soaps for sale. Thanks you so much. You have the best prices. Bramble Berry rocks! Thanks Marva! Congrats on starting your business and making it official! Thank! I have palm kernel flakes. I’m excited to try this recipe this w/e. I really appreciate and enjoy this website, videos and all the info the website gives. I use only olive oil and have been going to medium trace with oxides. Of late my soap has been cracking on top when drying in the moulds. Sounds like heat related cracking – does it look like this? http://www.soapqueen.com/bath-and-body-tutorials/cold-process-soap/successful-coconut-milk-batch-2/ That’s a heat related crack – dropping the temperatures would help OR insulating better so that the top doesn’t cool off as quickly. Thank you SO MUCH Anne-Marie for replying. You are SO great! LOVE all your blogs and videos and EVERYTHING! =) Thanks! Anne-Marie this is wonderful! I have a question – I am using your Impatien Pink High pH LabColor. The INCI mentions Germaben II. Do I still need to use it at the 1%? Also, I notice that the soap has a slight tannish coloring. Can I lighten it in the beginning with titanium dioxide? Thank you so much! What is “warm gel phase”? For a time, I was experiencing very hard and brittle soap that shattered whenever I tried cutting it after unmolding. Troubleshooting suggested that I was achieving too much trace. 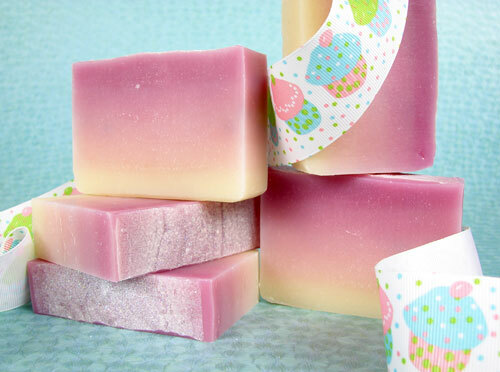 When I started pouring on softer trace, my brittle soap problem went away! How do I avoid brittle soap if I mix this to hard trace? Can you tell me how long you let this cure? I LOVE ALL the soaps you make on here. I’m beginning to try my OWN CP soap making and would LOVE to start w/ some of these soaps here that you’ve suggested (like this one, the hot cocoa one, the beer stout) BUT am wondering, can anything be used to substitute the palm and palm kernel oils?? THANKS! Phenonip tends to be oil soluble so yes, mix it with Polysorbate 20 to be on the safe side. How does the soap look now that it’s cut? I just made the soap with the blue, it’s in the oven now, so hopefully I will have beautiful soap when I cut it tomorrow morning! One other question I had, when I dilute my other labcolors that I have, can I use Phenonip? That’s all I have. I do have polysorbate 20 if I need to use it like you suggested with optiphen. Thank you! Fantastic as always. I am charmed with the explanation. I want to try also. Thank you for teaching us how it is done. This looks super fun!! I admire your creative soaps that you come up with!! Someday, I am going to attempt some soap! I can’t wait until you do! You are going to LOVE IT. It is soooooo addicting. It is a Kitchen-Aid bowl. You can buy it from their site under Mixer/Accessories for $75. Those look really cool! One day I want to give CP soap a try. It’s all about the temperature and fragrance/EO interplay – blend hotter than you usually do (like 140) and insulate. Now, this can backfire (see http://soap-queen.blogspot.com… and http://soap-queen.blogspot.com… so really know your fragrance well (is it a super heater? Hint: if it’s a spice, it usually will gel warmer than a plain vanilla) and plan accordingly. Optiphen can be used in aqueous (water) based solutions but tends not to mix very well. If you use Optiphen, I find a mixture of Optiphen and Polysorbate 20 at 1:1 helps it mix in better. I can’t wait to hear what you think when it comes out. I can see a rainbow really working beautifully with non bleeding colors too. Yes, oven process away so long as your mold uses hardware and not glue to hold it together. Fresh Snow – LOVE LOVE LOVE – and blue would be great. Yes, the Surplus Blue Labcolor IS already diluted. And don’t be surprised if you end up using MORE drops than I used. Just remember, what you see is what you get MINUS about a 15% color pop thanks to a really strong gel phase – so if it looks too light (see the final photos versus the final pour photos – that’s the color POP I’m talking about), don’t hesitate to add few more drops. Thank you – it was fun to make. The soap looks great. And the way you described the steps is like making a cake. I don’t know about trying it, because I’m not a super pacient woman, but congrats for trying and it looks amazing. Love the soap, I can’t wait to try it! 2 questions though. Since a strong gel phase makes the color pop more, is it O.K. to oven process it in the mold? And second question, I love the fresh snow fragrance, but I would like to use the blue labcolor. The one I have was the “surplus blue labcolor.” Is it already diluted? It doesn’t say on the bottle, and since it’s gone, it’s not on the website any more, so I don’t know if I should dilute it! That turned out SO perfect no one would have ever known it was measured so minutely and layered so carefully. This is a must try! Thank you so much for sharing this technique! The notes in “Fresh Snow” are intriguing….I am a sucker for heliotrope. This is beautiful! I can’t wait to try it, although I’ll be using a different color than the magenta shown above. Thanks for sharing this. I do have one question: How do I control whether my soap achieves a warm gel phase or a strong gel phase?